I finished these socks last weekend, but didn’t get around to taking some decent photos until today. After I’ve already worn them a few times, hence the pronounced fuzz around the socks in some places. 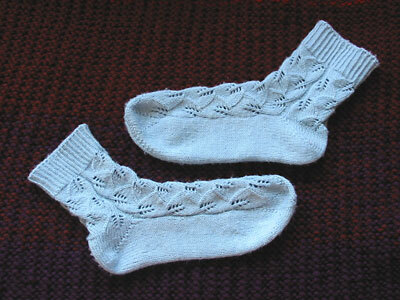 The pattern is lovely and easily adapts to the two-socks/two-circs technique. I did one less repeat on the leg portion, since I like my socks to be a bit shorter. And I did short-row heels. The finished socks are a tad smaller than I would like; I probably should have used US 2s instead of 1s. But I think they’ll probably stretch out a bit more with more wear. Fortissima Socka also isn’t the nicest sock yarn in the world. It can feel a little rough against the skin. The next time I knit such pretty socks, I might opt for prettier, more soothing sock yarn. CogKnition posted this on October 15th, 2006 @ 1:54pm in Finished Objects, Life as a Knitter, Socks & Slippers | Permalink to "Embossed Leaves Socks"
Yey!! Congratulations! They look gorgeous!!! wow – very cute. I like the short length. Well done. They have a beautiful design and color.